The documents distributed here have been provided as a means to ensure timely dissemination of scholarly and technical work on a noncommercial basis. Copyright and all rights therein are maintained by the authors or by other copyright holders (usually the publisher), notwithstanding that they have offered their works here electronically. It is understood that all persons copying this information will adhere to the terms and constraints by the copyrights acknowledged in the publication. These works may not be reposted without the explicit permission of the copyright holder. Detandt, S., Bazan, A., Quertemont, E., & Verbanck, P. (2017). Smoking addiction the shift from head to hands. Approach bias towards smoking-related cues in low dependent versus dependent smokers. Journal of Psychopharmacology; 31(7):819-829. doi: 10.1177/0269881117699606. Detandt, S., Bazan, A., Schroder, E., Olyff, G., Kajosch, H., Verbanck, P., & Campanella, S. (2017). A smoking-related background helps smokers to focus. An Event-Related Potentials study during a Go-NoGo Task in smokers. Clinical Neurophysiology, 128, 1872-1885. Bazan, A. & Detandt, S. (2017). The grand challenge for psychoanalysis and neuropsychoanalysis: a science of the subject. Frontiers in Psychology 8, 1259 doi: 10.3389/fpsyg.2017.01259. Mosri, D. F., Axmacher, N., Bazan, A. & Kessler, R. J. (2016). Continued Dialogue on The Oxford-style Debate from the 15th Annual Congress of the International Neuropsychoanalysis Society New York City, 2014, Neuropsychoanalysis, 18(1), 69-77. Bazan, A. (2015). The Role of Biology in the Advent of Psychology. Neuropsychoanalysis and the Foundation of a Mental Level of Causality. In: Neuroscience and Critique: Exploring the Limits or Neurological Turn. Jan De Vos et Ed Pluth, 173-187. Bazan, A. & Detandt, S. (2015). Trauma and jouissance, a neuropsychoanalytic perspective. Journal of the Centre for Freudian Analysis and Research (JCFAR), 26, 99-127. Bazan, A. (2013). Repression as the condition for consciousness. Invited commentary on : “The conscious Id”, M. Solms. Neuropsychoanalysis, 25, 1, 20-24. Shevrin, H., Snodgrass, M., Brakel, L.A., Kushwaha, R., Kalaida, N.L., Bazan, A. (2013). Subliminal unconscious conflict alpha power inhibits supraliminal conscious symptom experience. Frontiers in Human Neuroscience 5, 7, 544. doi: 10.3389/fnhum.2013.00544. Bazan, A. (2012). From sensorimotor inhibition to Freudian repression: insights from psychosis applied to neurosis. Frontiers in Psychology, 3, 452. Bazan, A. (2011). The grand challenge for psychoanalysis – and neuropsychoanalysis: taking on the game. Frontiers in Psychology, 2,220. Bazan, A. (2011). Phantoms in the voice. 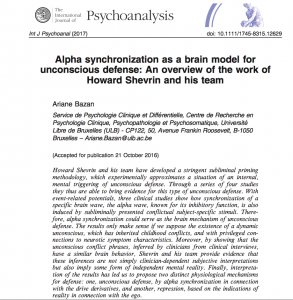 A neuropsychoanalytic hypothesis on the structure of the unconscious. Neuro-Psychoanalysis, 13, 2, 161-176. Vanheule, S., Roelstraete, B., Geerardyn, F., Murphy, C., Bazan, A., Brakel, L.A.W. (2011). Construct validation and internal consistency of the geometric categorization task (GEOCAT) for measuring primary and secondary processes. Psychoanalytic Psychology, 28, 2, 209-228. Shevrin, H., Snodgrass, M., Abelson, J., Brakel, L., Kushwaha, R., Briggs, H., Bazan, A. (2010). Evidence for Unconscious, Perceptual Avoidance in Phobic Fear. Biological Psychiatry, 67, 33S. Bazan, A. (2008). A mind for resolving the interior-exterior distinctions. Dans: D. Dietrich, G. Fodor, G. Zucker & D. Bruckner (éds. ), Simulating the Mind. The Mental Apparatus – A Technical Neuropsychoanalytical Approach. (Engeneering and Neuro-Psychoanalysis Forum Book). Springer, Wien, 394-399. Bazan, A. (2007). An attempt towards an integrative comparison of psychoanalytical and sensorimotor control theories of action. In: P. Haggard, Y. Rossetti & M. Kawato (eds. ), Attention and Performance XXII. Oxford University Press, 319-338. Bazan, A., Shevrin, H., Brakel, L.A.W., Snodgrass, M. (2007). Motivations and Emotions Contribute to A-Rational Unconscious Dynamics Evidence and Conceptual Clarification. Cortex, 43,1104-1105. Bazan, A. (2006). Primary process language. Neuro-Psychoanalysis, 8, 2,157-159. Villa, K.K., Shevrin, H., Snodgrass, M., Bazan, A., Brakel, L.A.W. (2006). Testing Freud’s hypothesis that word forms and word meanings are functionally distinct in the unconscious: Subliminal primary process cognition and its links to personality. Neuro-Psychoanalysis, 8(2),117-135. Bazan, A., Van Bunder, D. (2005). Some comments on the emotional and motor dynamics of language embodiment. A neurophysiological understanding of the Freudian Unconscious. In: H. De Preester & V. Knockaert (eds. ), Body Image & Body Schema, interdisciplinary perspectives. John Benjamins: 49-107. Knockaert, V., Geerardyn, F., Van de Vijver, G., Van Bunder, D., Bazan, A. (2004). Trauma as an Encounter With the Real. International Journal of Computing Anticipatory Systems, 16, 81-91. Bazan, A. (2002). The unconscious as affect sticking to phonology. Considerations on the role of articulation. Psychoanalytische Perspectieven, 20(4), 579-590. Bazan, A., Geerardyn, F., Knockaert, V., Van Bunder, D., Van de Vijver, G. (2002). Language as the source of human unconscious processes. Evolution and Cognition, 8(2), 164-171. Bazan, A., Geerardyn, F., Knockaert, V., Van Bunder, D., Van de Vijver, G. (2002). Anticipation as exercising (language) motor programs during dreams. A neuropchoanalytical hypothesis. In: International Journal of Computing Anticipatory Systems, 12 (D. M. Dubois, Ed. ), CHAOS, Liège: 181-194. Geerardyn, F., Van de Vijver, G., Knockaert, V., Bazan, A., Van Bunder, D. (2002). “How do I know what I think till hear what I say”: On the emergence of consciousness between the biological and the social. Evolution and Coginition 8(2), 249-255. Geerardyn, F., Knockaert, V., Van de Vijver, G., Van Bunder, D., Bazan, A. (2002). Anticipation, the Subject and the Partial Object. A Psychoanalytical Approach, Casys. International Journal of Computing Anticipatory Systems 12, 222-229.34. Van Bunder, D., Knockaert, V., Van de Vijver, G., Geerardyn, F., Bazan, A. (2002). The Return of the Repressed, Anticipation and the Logic of the Signifier, Casys. International Journal of Computing Anticipatory Systems, 12, 293-301. Van de Vijver, G., Knockaert, V., Van Bunder, D., Bazan, A., Geerardyn, F. (2002). Anticipation and identification a comment on Lacan’s Mirror Stage, Casys. International Journal of Computing Anticipatory Systems, 12, 301-315. Van de Vijver, G., Van Bunder, D., Knockaert, V., Bazan, A., Geerardyn, F. (2002). The role of closure in a dynamic structuralist viewpoint of psychic systems. Evolution and Cognition, 8(2), 262-271. Bazan, A., Van de Velde, E., de Paepe, B., Fraeyman, N. (2000). Properties of the ventricular adrenergic signal transduction system during ontogeny of spontaneous hypertension in rats. Journal of Cardiovascular Pharmacology, 35(4), 653-663. Bazan, A., Van Emmelo, J., Fraeyman, N. (2000). G-proteins in kidneys of Spontaneously Hypertensive Rats. Life Sciences, 66(6), 511-520. Fraeyman, N., Vande Velde, E., Van Ermen, A., Bazan, A., Vanderheyden, P., Van Emmelo, J., Vandekerckhove, J. (2000). Effect of maturation and aging on ß-adrenergic signal tranduction in rat kidney and liver. Biochemical Pharmacology, 60, 1787-1795. Bazan, A., Fraeyman, N. (1996). Use of elastase as aninternal standard in immunoblotting techniques. Biochimie, 78, 273-276. Bazan, A., Fraeyman, N. (1995). Ontogeny of Gs- and Gi-proteins in kidneys of Spontaneously Hypertensive Rats. Archives Internationales de Pharmacodynamie et de Thérapie, 329-343. Bazan, A., Fraeyman, N. (1994). Ontogeny of renal Gs-proteins in Spontaneously Hypertensive Rats. Archives Internationales de Physiologie, de Biochimie et de Biophysique 102, B69. Fraeyman, N., Bazan, A. (1994). Characteristics of Gsa-proteins in heart of Spontaneously Hypertensive Rats. Clinical Experimental Pharmacology and Physiology S1, S24. Fraeyman, N., Bazan, A., Vanscheeuwijck, P. (1994). Thermodynamic analysis of isoproterenol binding to ß-adrenoceptors in rat lung membranes. European Journal of Pharmacology – Molecular Pharmacology, 267, 1, 63-69. Bazan, A., Van de Velde, E., Fraeyman, N. (1994). Effect of age on ß-recptors, Gsa- and Gia-proteins in rat heart. Biochemical Pharmacology, 48, 3, 479-486. Fraeyman, N.,Bazan, A. (1993). Aging and cardiac beta-adrenoceptors in two rat strains. Drug Design and Discovery, 9(3-4), 300. Bazan, A., Fraeyman, N. (1993). Influence of age and hypertension of receptor-G-protein coupling in rat ventricle. Archives Internationales de Physiologie, de Biochimie et de Biophysique 101, B3.